La Roseraie de Saint-Vincent is a spectacular rose garden in Saint-Vincent in the Pyrenees Atlantique department of south west of France. The rose garden was voted favourite garden in the Aquitaine region of France 2013 by the French television programme France2. The rose garden and rose nursery of Saint-Vincent occupies a splendid location with views over the foot hills of the Pyrenees. The mountains form a wonderful backdrop to the rose garden which contains over 800 different varieties of rose. The garden follows a path winding through fabulous displays of all different types of roses offering an explosion of colours and scents. 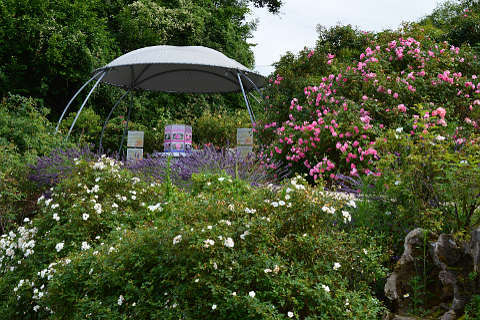 There are 5 kiosks in the grounds which provide information about various topics based around roses, and growing roses. Once you have been inspired by the huge variety of roses you can visit the pepiniere to buy one or two if you wish. The pepiniere closes at lunchtime and all day Sunday in low-season but otherwise keeps the same hours as the garden. There is also a restaurant whose terrace has views over the Pyrenees where you can enjoy lunch or dinner. A shop on site sells rose-based products such as rose-scented massage oil and rose-scented perfume. The rose garden is open all year round from 9.00-18.00 apart from Sunday mornings. The address is: Le Pepiniere de la Roseraie de Saint-Vincent, 64530 Saint-Vincent. Entrance to the rose garden and nursery is free. The Public garden of Tarbes, Jardin Massey is a lovely garden centred around a large glass pavilion. It has been awarded 'Jardin Remarquable' status.